Theewaterskloof Dam on 7 June 2016. The world is watching Cape Town, counting down to Day Zero. This represents the point at which the municipality will turn off most of the city's water distribution system. The date is not certain; it has shifted several times, and is currently predicted to arrive on July 9. We used system dynamics, a modelling approach, to understand how the water collection plan might work. The idea was to simulate water collection as per the city's plan over the course of a single day (24 hours). We made some key assumptions about population size, the number of taps per distribution site and other factors. Taking these into account, the model found that it would require 12.5 hours to provide water to Cape Town's entire population per day. And the real figure might be even higher if "random shocks" like conflict happen at the water points. Our findings suggest that the city's best technical intervention would be to double the number of distribution points to 400. This would save time and ensure that Cape Town's whole population can be serviced. Another, perhaps more practical approach, would be to keep 200 distribution points but increase the number of taps and the water pressure at each of them. But even these strategies won't help if Cape Town doesn't address the reality of conflict and related delays. These are unpredictable and incalculable. They are also the greatest indication for why Day Zero should be avoided at all costs. Cape Town's population is estimated at 4 million people. Of these, 700 000 live in two areas that won't have their taps turned off. These include strategic sites, like hospitals, and informal settlements. Another 800 000 people live in close proximity to informal settlements and could potentially source water there. Based on these assumptions we calculated that 2.5 million people will be required to collect water at designated water points. These dynamics change the aggregate impact from the well-organised technical solutions proposed above. They can be represented as random shocks, referred to here as "disruption noise". This could dramatically increase the time needed to service each person, implying that fewer people are serviced per hour. This is illustrated in figure 2. 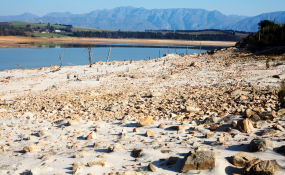 Cape Town has managed the use of water from the demand side, for a long time. But hasn't made many interventions on the supply side, which partly has led to the crisis.